210 Landing Gear Rigging (K thru R Models) Part 4 - M Model Rig and the “special” M Model Rig | Tennessee Aircraft Services, Inc. The 210M model is a little bit of a special case. There are two distinct gear systems which I’ll define as 210M1 for 1977 models s/n 21061574 through 21062273 and the 210M2 for 1978 models s/n 21062274 through s/n 21062954 (the 210M series include the 1978 P210N). For the purpose of simplicity going forward, I’ll refer to the first serial number group as 210M1 and the second serial number group as 210M2. The first year of the P210 was 1978 and was called a P210N even though it was built alongside the T210M and 210M. For that reason, the 1978 P210N is actually a pressurized version of the 210M and has the 1978 version of the 210M landing gear (210M2). If you’re watching close, you’ll note that makes the 1978 P210N the only year of a P210 delivered from the factory with gear doors. There are two major differences between the 210M1 and the 210M2 landing gear systems. One is the wiring of the squat switch and the power pack pressure switch. On the 210M1 series, the power pack pressure switch will apply power to the motor relay any time the hydraulic system pressure drops below a predetermined value. On the 210M2 series, the same power from the pressure switch must also pass through the squat switch prior to energizing the motor relay. The end result is that 210M1 series will power the gear motor as soon as the aircraft master is turned on if the system pressure has dropped below the limit. 210M2 series won’t power the gear motor until the nose gear strut is fully extended, which happens at the first bump on the taxiway or at takeoff rotation. 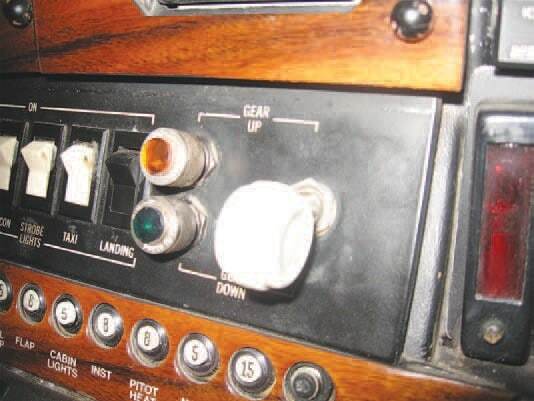 The 1978 210M gear system has an electric switch, like this one, for gear position selection. The second major difference between the 210M1 and 210M2 is the gear up gear down solenoid. In the 210M1 series this electric solenoid is an integral part of the power pack and moves the control valve from sending hydraulic pressure to the gear down side of the system or the gear up side of the system. On the 210M2 series the gear select switch is replaced by a gear select valve. The select valve performs the functions of the select switch as well as the solenoid. 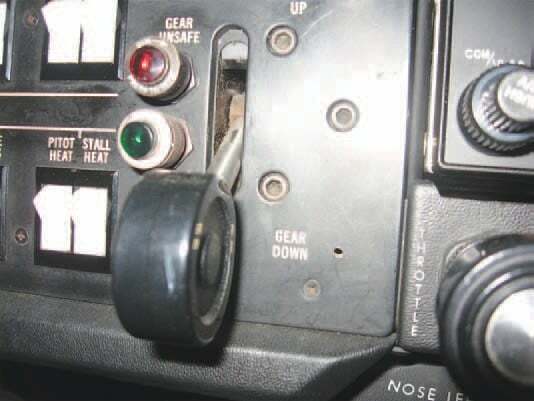 It’s easy to tell which system is in the plane just by looking at the gear select handle; if it’s a small knob attached to a switch, it’s a 210M1, but if it’s a larger black knob that pulls out and moves like a lever, it’s a 210M2. All the rigging procedures for the 210M are basically the same as the 210L we discussed last month, with just a couple of minor changes. For the sake of not duplicating the reading, we’ll only note those changes with the understanding that everything else remains the same as the 210L. The paragraph numbers listed below are from the 210M series manual and are for reference only. They will not match with the 1978 P210M service manual paragraph numbers, so you’ll want to note the title of the paragraphs for cross reference. The general sequence of checks for the 210M would be very nearly the same as the 210L, so the following are listed as inserts to last month’s 210L rigging process. These checks would not be part of a standard rigging check unless it was suspected as a problem. If it is decided to do these checks, then performing them just before or just after the pressure switch adjustment makes sense. Paragraph 5184 gear manifold assembly adjustment fig 527 & 28 This adjustment is equivalent to the snubber adjustment on the 210L system. Unless the gear moves into the up or down locks with enough force to jar the aircraft, there’s no need to make a change. The 210M, T210M and the 1978 P210N are very much transition models when it comes to the landing gear system. The basic structure remained the same in terms of actuators, doors, downlocks and uplocks. The methods to engage and operate the electric motor and direct the hydraulic pressure definitely changed. I don’t know if these changes from the 1976 210L to the 1977 210M to the 1978 210M are intentional stepping stones to the final version of the system in the 210N and 210R models or if they just represent a natural progression in design. Either way, the last version of the system, that we’ll discuss next month, is a wonderful exercise in simplicity and reliability.